Gissur is a Nord beggar and an informant of the Thalmor. He can be overheard arguing with Rulindil in the Thalmor Embassy during Diplomatic Immunity. If he is not slain during the infiltration of the embassy, you will later meet him in the Ratway Vaults during the quest A Cornered Rat. Gissur wears a set of farm clothes and a pair of boots, and wields a leveled dagger (up to elven quality at level 20). He carries a huge amount of items, including two leveled poisons of damage health, and one leveled poison of damage stamina. He will always carry a leveled gem, with an additional 25% chance of another gem, some regular food, some prepared food, and has a 75% chance of carrying up to three randomly chosen beverages. Lastly, he carries a spare belted tunic and a small amount of gold. If encountered during your search for Esbern, he also carries a note, on which is a description of his target and the instructions to inform his assigned contact if he spots you. 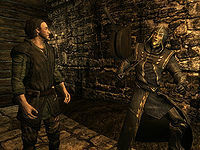 You will encounter Gissur for the first time during your infiltration of the Thalmor Embassy, specifically inside Elenwen's Solar, where you will overhear him and Thalmor interrogator Rulindil talking about the imprisoned Etienne Rarnis. Gissur will then obey orders and leave the Solar, muttering to himself as he goes. "He can't treat me like that. He needs me. ", "Rulindil, pah! One day, the shoe will be on the other foot. ", "I knew he was telling the truth. I always can tell. ", "They're scared of the dragons, too, aren't they? Paying too well. They don't know anything." and "Etienne must know something related to the dragons... who else might know? Greasy Thom... no, they'd see right through him..." At this point, he will be hostile and attack you on sight. Should you, however, manage to talk to him by using a Pacify spell, he will brush you off with, "You must be new. We don't talk to each other here." He was supposed to have two other random responses but due to a minor bug, these will never be spoken at all. He will wait in the courtyard as ordered, and will never enter the Solar again. Gissur: "He's/She's in the Flagon right now. Get ready." Gissur: "Of course I'm sure! He/She was asking about Esbern." Thalmor: "Doesn't matter. We'll kill them either way." 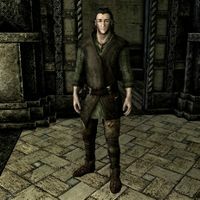 The group of Thalmor will patiently wait until you have uncovered Esbern, and will typically attack you in either the Ragged Flagon (where the regulars will come to your aid), or the Ratway. If you have advanced far enough in the Thieves Guild questline and take the shortcut through the Cistern, Gissur and the Thalmor will instead attack you on the streets of Riften, so be careful of unwanted casualties. In either case, you will have to take Gissur down, along with his Thalmor friends. When talking to you at the Thalmor Embassy, Gissur was supposed to say two additional lines, but they will never be heard: "You here to see Rulindil, too, eh? None of my business of course." and "Push off, will you?" This page was last modified on 13 August 2014, at 18:02.